DENON DN -X300. The versatile Denon DN-X300 Professional 2-Channel DJ Mixer. Crossfader start and channel fader start triggering is possible and compatible with the DN-S5000, S300, S1000, and more. Also features 3-band EQ knob with 3-way kill switch. Phono Amp with high S/N ratio, equivalent to Denon Hifi products. USB MIDI Clock In BPM Detection -for use with, Traktor, Torq, Ableton, Cubase.etc. High sound quality high output Headphone Amplifier. The Denon DN-X120 mixer works very well! Unfortunately I don't have the power cable anymore. It comes with the Manuel. Regular signs of usage. Cross Fader Start and Channel Fader Start. To achieve the exceptional performance, a floating 32-bit SHARC Digital Signal Porcessor empowers the fully digital circuit, ensuring low noise and top-notch audio fidelity. The X1800 also has two USB audio interfaces bringing your choice of laptop based DJ software into the mix, plus handling quick and easy DJ changeovers in busy, live gig situations. Want even more connectivity?. The Mark 2 is fully MIDI-compliant to work with other software solutions via supplied or created mappings. Denon's original, X-F Link Audio/Video Assignable cross-fader function (for Serato Video w/upgrade). Works great. Missing a couple of knobs. 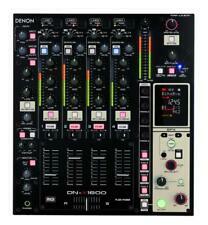 Denon DN-X1500 4-Channel DJ Mixer . Condition is Used. Shipped with USPS Priority Mail. The OLED screen is bright and easy on the eyes especially in low-light situations. Four-Channel Digital Mixer with four phono/line switchable channels. Two high-quality mic inputs allow you to engage the crowd, while monitoring the cue/split/master mix with either 1/4 or 1/8" headphone connectivity. Warm greetings from Japan. part is seen place excepting excepting special excepting large scratch, dirt less condition. What is reflected in the attached picture is all. This item was unable to be tested due to not having a specific cable to test the DJ channel mixer. A knob is missing from this device. No power cable or accessories are included. The OLED screen is bright and easy on the eyes especially in low-light situations. Two high-quality mic inputs allow you to engage the crowd, while monitoring the cue/split/master mix with either 1/4 or 1/8" headphone connectivity. 4-CHANNEL DIGITAL MIXER WITH 4 PHONO/LINE SWITCHABLE CHANNELS. We also have a wide variety of vinyl records, CDs, DVDs, VHS tapes and slipmats. Our record selection includes the best in Top 40, House, Breaks, Electro, Jungle, EDM, Chicago, Hip Hop, Old-School Hip-Hop, Disco, Soul, Funk and much more. 5 out of 5 stars - Denon DJ 4-CHANNEL DJ CLUB MIXER BRAND NEW IN BOX AUTHORIZED DEALER! 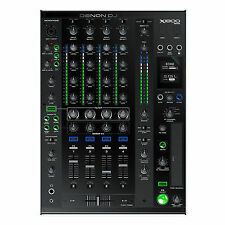 2 product ratings2 product ratings - Denon DJ 4-CHANNEL DJ CLUB MIXER BRAND NEW IN BOX AUTHORIZED DEALER! A pro mixer in perfect working order. Works as it should. Single Denon DNX 1500 Mixer. USB MIDI In/Out and 5-pin MIDI Out. MIDI mapping for various software is available. 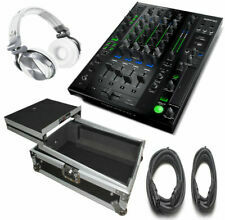 4-Channel Digital DJ Mixer with Studio Quality Components & Specifications. Worlds First Professional DJ Mixer w/32-Bit DAC Output. This versatile mixing solution is designed for all types of DJs, as it features software compatibility as well as full functionality for non-software DJs. The DN-X600 features a 24-bit 96kHz USB 2.0 Audio Interface (sound card) with 4 in / 4 out (stereo) channels. Denon X1800 Prime - 4-Channel DJ Mixer ABSOLUTELY MINT condition. Excellent 4 channel mixer. Collection in person only. Selling as surplus to requirements. Used on a few occasions at home as part of a home set up. Comes with original box and all accessories. Smoke and pet free home. Collection b72 only. Message on 07866 363986 for questions. What is the warranty period on Electromarket products?. Keyboard Amplifiers. Key Features. In Ear Monitoring. Can I reserve item(s) that I intend to buy later?. Product Code: SSC1974. When will I receive confirmation of my order?. Digital DJ Mixer 4 CH. Independent Effects unit with 14 Effects available for each channel. 32-bit DAC output selectable (44.1/48 kHz). Rock solid construction, superb audio fidelity, high quality parts, and of course reliability are the core ingredients of our design. Condition is Used. There’s one on here for £175 so starting this lower to clear.